"A Perfect Way to Experience Spring in DC"
This was my 8th running of the Cherry Blossom Ten Miler and definitely one of the most beautiful. Early April in DC is always a question mark - it could be snowing, it could be in the 80's. Anything's possible. But this year was just about perfect. However, even on the worst weather days, this race will always keep me coming back. The Cherry Blossom Ten Miler is a lottery entry. The lottery always opens in December, is open for ten days, then you find out if you're in. But don't worry if you don't get a lotto entry - there are bib transfers open in February for all those people who thought running sounded like a good idea in December, then changed their minds. And of course, if you volunteer, you don't have to get in through the lottery, so here's another promo for race volunteering. One thing I love about registration is the options. This race is CHEAP. With all the fees, this race cost me $51. Now, that's the bare bones entry. The registration comes with your race and a cotton t-shirt. For an added fee, you can get a tech shirt. For another added fee, you can also get a medal. I'm trying to cut back my expenses, so I didn't go for the medal, but was tempted. But the great thing is that you can do what you want. Love medals? Get the medal! Hate medals? Don't get the medal! Something for everyone without added expense to those of us trying to cut back. I may be biased because I know a bunch of people who work with the team at CUCB, but their communication is phenomenal. They work so hard to make sure everyone has the info they need and their social media person is top notch! While there isn't a ton of parking down near the race start, DC is filled with easy-to-access parking garages within walking distance. Metro isn't open early enough to get you to the start, unfortunately, but there are plenty of other options. Race start is also easy to find. Just look for the Washington Monument. You can't miss it. This race has a colored corral start, and the team did a great job making sure everyone knew where their corrals were. Also, there are plenty of portapotties. Yes, there are lines, but they're not bad. The race publishes the order of the wave starts and the times that they start, so if you're in one of the back waves, you know that you have time after the official start to hit the bathroom and such. It makes for such a relaxing start. The waves all get off within 25 minutes of the start, which gives the crowds a bit of time to spread out. The only time I really noticed any congestion on the course was within the first mile, but I think that goes for just about every race I've ever done. And it certainly wasn't terrible - I never had to slow to a walk due to crowds. The course is beautiful. You get to run past so many DC sights and out onto Hains Point, where the cherry blossoms really shine. There were plenty of people stopping for selfies and photos (just make sure to step off the run course, guys!). The course is relatively flat until the very end of the race, just a few little rollers. (Yes, it seems cruel to put a hill right at the finish.) 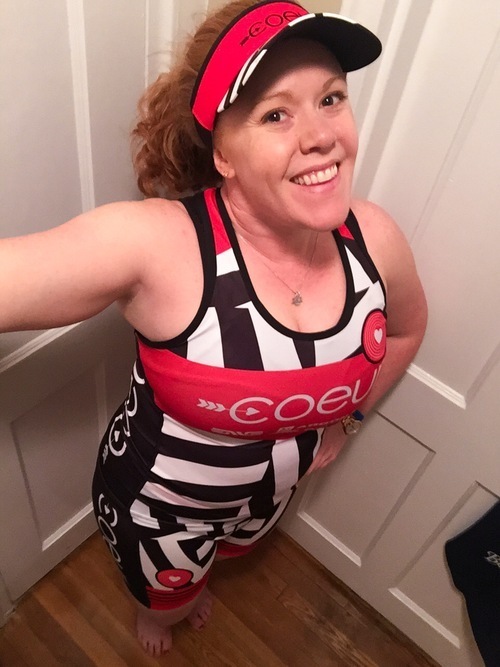 I think of it as a generally easy course and one that's really enjoyable to run. The volunteers are PHENOMENAL. Seriously, these people are amazing and cheerful and work so very hard. I don't know how CUCB gets so many great volunteers, but I'm so glad they come out. After the race, there's water and snacks, standard stuff for a race. You can also go pick up your medal if you purchased one. This year, there were some issues with lines at bag check, but they've already apologized and indicated plans to fix it for next year, which made me really happy to see. This race really does a great job of listening to people and putting on a great race. They've dealt with all sorts of issues (weather, accidents diverting the course, etc), and each year is still stellar. I'll be back in 2020! "A Great Start to a New Challenge"
This was my sixth year running the Space Coast half and I was not disappointed. This year, they started a new medal series honoring the manned space missions. The four years will honor Mercury, Gemini, Apollo, and the Shuttle missions. And of course, there is bonus bling to be had. Run any 3 years, get the Moonwalk Challenge medal. Run all 4, get the Hall of Fame medal (plus the Moonwalk Challenge medal). I don't normally run races for the bling, but seriously, these medals are phenomenal. Of course, it isn't just about the medals. If a race isn't well run, I'm not going to show up. The full marathon is a course comprised of two separate loops - a North loop and a South loop. In previous years, the half consisted of just the south loop. The full has a 7 hour time limit, so the half also had a 7 hour time limit. This year, they offered a second half course on the north loop. Because it was the first half of the marathon, that meant that North Loop runners started with the marathoners and had 3.5 hours to finish. At sign-up time, I was not running at all thanks to my labral tear, so I opted for the South Loop. I knew the course, I liked it, and I liked that I had 7 hours to finish. One awesome thing about this race is that if you're a slow runner or even a walker, you can absolutely do the South loop half and you won't be all alone. There are tons of people who are walking so it's a great race for someone who is worried about keeping a 16 minute mile. Communications for this race were great. The race directors sent a number of emails to make sure we had all the information we might need. They even included a helpful map of parking for the expo, which this year, was across the street. For added safety, there were police stopping traffic on the road between parking and the expo to ensure that everyone crossed safely. It was an awesome addition. The expo wasn't huge, but there were a number of good vendors there. If you needed something for your race, you could get it. The race-specific merch was pretty great too. The race shirt itself is a long-sleeved t-shirt and the sleeve featured patches from the Mercury missions. Some say it's too gaudy, but I love it. The only downside to this race is the parking at the race site. There isn't really any, so you have to find a place to park nearby. There are plenty of locations to choose from, but it's the one frustrating part of the race weekend. There are busses from various hotels, but I've had sporadic luck with them. If you do choose to take the bus, always take the earliest one. Trust me. This race had a North and South Course that all started at the same time in the same place. South runners to the left, North to the right. It was surprisingly not as confusing as I feared it would be, though it took over ten minutes for everyone to get across the start line. The race course itself is lovely. Relatively flat, along a road with houses on one side and waterfront on the other. The locals often come out to cheer or set up aid stations for the runners. If you want to do shots during a race, this is your course. The water stops are incredibly well manned and everyone is so very friendly. The course support is absolutely phenomenal. This year, the finish party was still in the park like normal, but the finish line was no longer right there, which was a bit disappointing. My favorite part of the race was finishing while friends cheered me in, going and getting some post-race food, then cheering people in while I ate. The new finish made that hard, and it was also much more anti-climactic. That said, the post-race spread is awesome - eggs and pancakes, pizza, beer, soda, and of course water and bananas. And a finisher's towel along with the medal! Perfect for keeping warm or sitting on picnic style as you feast! This was my tenth year running this race - so I'm probably a bit biased. Packet Pickup was smooth as usual. I stopped by on my lunch break on Friday and it was a quick process. The expo is huge, but it's really geared towards military families, and this year, I was less impressed by the wares. There were tons of freebies though. I just didn't need to collect any more water bottles! Race morning came as normal. I will admit, I wasn’t super motivated to run. As has become my routine, I planned to arrive at a local parking garage by 6 am. Definitely earlier than I needed to be there, but as roads are shut down, it’s just easier to get there and be ready to go. Things were a bit different for the race this year due to some road construction. It meant that the course was different and the start was a bit different. They added two additional start waves to help thin out the crowds. Typically, we would have gathered in grouped corrals in the Pentagon parking lot, and then led to the start. Due to the construction, the corrals were lined up in a straight line from the start. Since I was in the 9th wave, the brand new pink wave, that meant the start was a hike away. Some people opted to not go to the corral and instead wait for the corral to come past them, but we opted to go to the corral and wait. As per usual, the wheelchair racers were finishing before we started, and just as we got to race start, the race winners were coming in to the finish as well. That’s aways a bit funny and a bit demoralizing. Mostly, I was jealous they were done. While this year’s race wasn’t as hot as last year’s, the humidity was ridiculous. My weather app said the humidity was 90%; the race announcer said it was 100%. Either way, it was disgusting. The race started and I started my intervals and within ten minutes, I was dripping sweat. I opted to run with a handheld water bottle for this race. Nowhere near enough fluid to get me through the race, but more than enough to get me between water stops. And I was definitely glad I had it. The first water stop was around the two mile mark and they were out of water cups (though I believe they had cups of Gatorade). Volunteers were pouring water into mouths, into cupped hands, and in my case, into my water bottle. Due to the heat, people were taking multiple cups (not blaming them – it’s just what happened) which meant they ran out by the late corrals. I had my bottle refilled and went on my way. Due to the rerouted course, there was one spot where the race came to an absolute standstill. I’ve never had that happen in this race before, even with 35,000 racers. It didn’t last long, but it was certainly a surprise. At one point, I ended up running alongside a vision impaired runner and his guides. I was so impressed with their process. The runner and one guide were each holding onto a large ring, and it was seamless how the guide would call out directions. The second guide ran right behind them, blocking anyone from attempting to cut between them. They moved as this tight little pack and it was so cool to see. 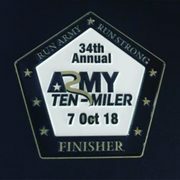 This race is always so organized, thanks to the amazing volunteers and the organization of the Army. So I was really surprised when we got to mile 7 and there was no more Gatorade at the stop. I don’t typically use it, but was shocked that they were out. That said, there was plenty of water everywhere, which was great since by that point, I was ready to pour it on myself. Which I did. This year, thanks to injury, I was slow enough that I saw the cutoff after it was closed. Around mile 5 or so, if you’re behind required pace, they divert the course because of roads that have to be re-opened. This only cuts about two miles off of the race. I’m usually enough ahead of it that I don’t see it, but this year, the diversion was in place by the time I looped back to that spot. This unfortunately had an impact on my race. At the beginning of a race, you’re always passing people and being passed, but by midway or so, things have usually settled out. Sure, you are still being passed or passing, but not to a great extent. However, when a group of slower people is diverted, that whole process has to start over. For the most part, it wasn’t problematic, but I definitely got caught behind a few packs of walkers who didn’t realize they shouldn’t take up the whole course. The hardest part of this race for a lot of people is the bridge near the end. It’s the same bridge that destroys people at Marine Corps Marathon. I don’t usually have an issue with this bridge. Not so this year. I was starting to get fatigued and I was just mentally tired of running, so this bridge felt so very long. It felt great to get off the bridge. I got my second wind sometime around mile 8.5, mostly because I knew I was getting close to being done. Plus by that point, you’re back with the crowds again, which definitely helps motivate. And finally, FINALLY, I was done. I crossed the finish line and was handed a bottle of water. I made my way through the crowds, got my finishers coin, and walked towards the food. They seemed to have a ton of extra food this year, as usually by the time I finish, pickings are slim. The volunteers were also pushing water like crazy. I was still finishing my first bottle when I was handed two more bottles. The food offered was all packaged - cookies, bagels, muffins, and a fruit cup, plus bananas. Nothing too fancy, but quick and easy. All in all, I was super delighted to be able to finish, and I will certainly be back for my 11th running next year! 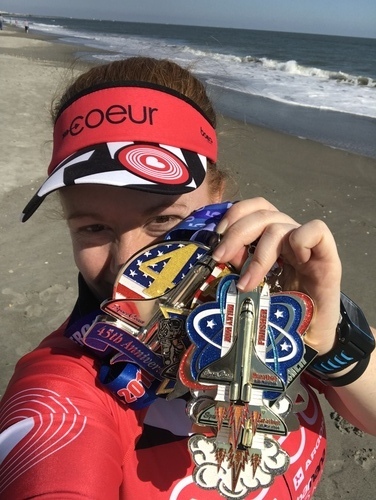 "Awesome close to a fabulous series"
I don’t normally race for medals, but when Space Coast announced their series of shuttle medals, I was in. And I’m so glad I signed up. This race has a small town feel with a big number of runners. It’s my favorite sort of race. First and foremost, everyone is insanely friendly. The aid stations are awesome. I’m not sure which one is my favorite. There are youth groups, a Jimmy Buffett Fan Club, and more, all trying to make their aid station the best. And then there are the unofficial aid stations, people sitting out in their front yards offering drinks (I swear there was a full bar out there), fresh cooked bacon, pancakes, and more. Yes, while you run! It’s such a fun atmosphere. The course is an out and back, but that’s something I enjoy because I can watch for the other runners and I can see my friends who are running, no matter if they are faster or slower than I am. Plus then I know what I’ve got coming for me on the course. Of course, this course is fast and flat, so there isn’t too much to worry about. Post race, in addition to the fabulous medal, there is a great pancake breakfast, pizza and beer, and awesome towels, great for sitting on while you eat, and then taking to the pool later. Even though this race ended the five year series, you had better believe I signed up for the next one! 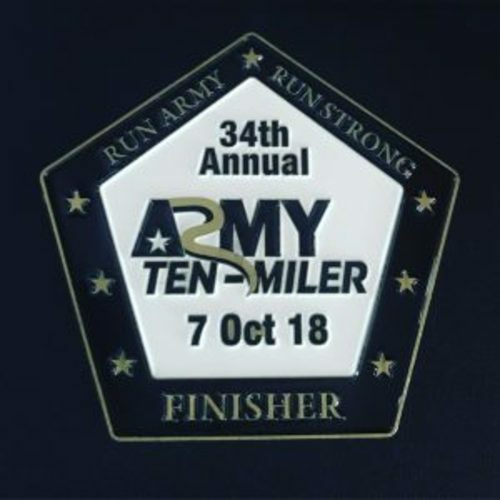 Any race managed by a military branch is guaranteed to be incredibly organized and the Army Ten Miler is no exception. This ten miler is huge, and yet they manage to get all of the racers across the start line in a clear and efficient manner. The 2017 race was unusual in that the DC area was experiencing extreme heat, and to get people off the course faster, around a mile was cut off for runners in the later waves. I was not affected by this, but was surprised to learn the race had been altered when I reached the finish, as there was no discussion of a change for safety while out on the course. That said, the aid stations were amazing and soldiers were throwing water at people who wanted it. They did everything they could to keep us safe, which is the ultimate goal.